With room for up to six adults, the evolutionary Claremont™ spa is loaded with modern, thoughtful details. 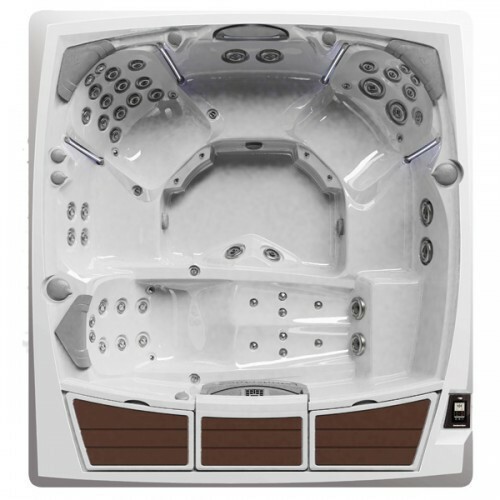 Wrapped in breathtaking cabinetry and offering more ways to relax than ever before, this 980™ Series model will change the way you use your spa. Fall in love at first sight with the crisp, rhythmic texture of the exterior cabinetry highlighted by corner illumination. This eye-catching combination of classic beauty and architectural form is further enhanced by a low-profile flat top rail and beautiful lounge deck with illuminated SunCooler™ cold storage areas for additional seating and convenience. Throughout the Claremont™ you can melt away stress and strain in seats that feature popular combinations of our Patented Fluidix® Jets. Reminiscent of a reclining chair, the lounge seat is molded to support your body in comfort so you can lay back and relax without the worry of floating around. As you surrender fatigued muscles in your neck, back, hips wrists, legs and feet, this full-body massage equals total relaxation. Throughout the rest of the Claremont™ spa, wide seats inspired by some of our most popular models are highlighted by the even glow of LED lighting for both beauty and safety for your family. And conquering stress and strain with the widest back and leg coverage we’ve ever offered while soothing your body and senses with specialty SilentAir™ injector jets and SunScents® Aromatherapy, total relaxation is just steps away. Enjoy your spa day or night with a Glass i-Touch Control, equipped with SunSmart® 2.0 WiFi Kit, for remote access and to keep you informed of the status of your spa. And, tool-free cabinetry and an advanced MicroClean® Ultra Water Management System make maintenance a breeze.